Register to join the Mobile Web Ghana hosted, Microsoft AppFactory and get free training and mentorship in app and web development. 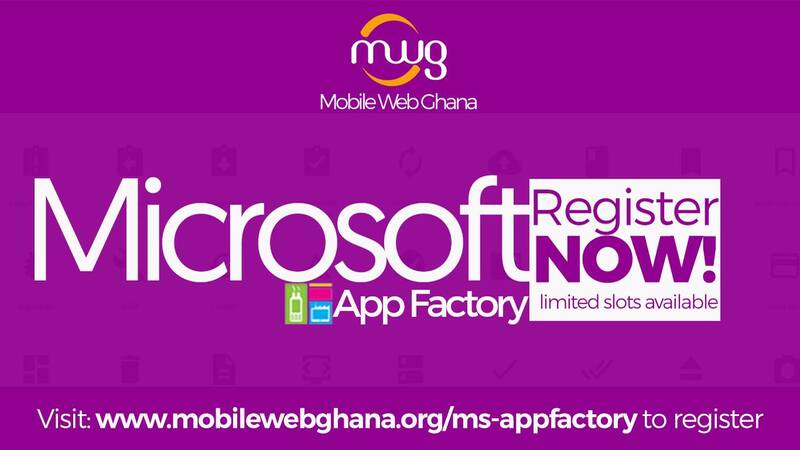 Mobile Web Ghana is accepting registration from interested applicants to the 2nd cohort of the Microsoft AppFactory fellowship. The program under the Microsoft 4Afrika initiative, is a partnership between Microsoft Ghana and Mobile Web Ghana. Earlier this year the program was officially launched at Mobile Web Ghana’s new campus. The Microsoft AppFactory is a fully sponsored program where selected applicants get trained in Microsoft Technologies including Mobile Development, Web Development, Windows Development, project management, etc. The program is also aimed at equipping the young software developers with hands-on experience while helping them build critical business skills to secure jobs or create their own businesses. Head over to the registration page to get started. A limited number will be selected so hurry to process your registration and don’t for get to let a friend know about the program. Registered for the program, let us know what you think in the comments.